Anytime you or I are looking for electronics we always know who makes the best fill in the blank brand. For cars it might be a certain brand like Ford or Honda for example. If you're looking at stainless steel scales that allow you to enter a target weight and then upper tolerances and lower tolerances, then you probably need to look at the Doran Scales 2200CW checkweigher. Doran is well known in the scale industry for their high quality stainless steel washdown scales. In fact, it's the product that they built their business with. The flagship checkweigher for Doran is the 2200CW. 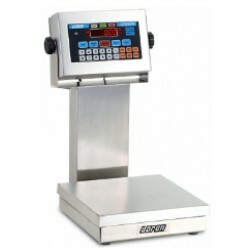 If you're looking to set a target weight or target range of acceptable weights and push rejected boxes or items to the side then please contact us for additional information or a price quote for this check weighing scale from Doran Scales.